When I use Alexa Donations to accept charitable donations, what's the donor experience? When I use Amazon Pay to accept charitable donations on my website, what's the donor experience? How do I enable Alexa Donations? How do I add the Donate with Amazon button to my website? What important information do I need to know before I use Amazon Pay or Alexa Donations to collect charitable donations? After I've added a Donate button on my site or have enabled Alexa Donations, is there anything else I need to do? When will I receive the funds that have been donated to me? Does Amazon Pay send tax receipts to my donors? How do I view information about the donations that have been made to me? How are refunds and chargebacks handled? 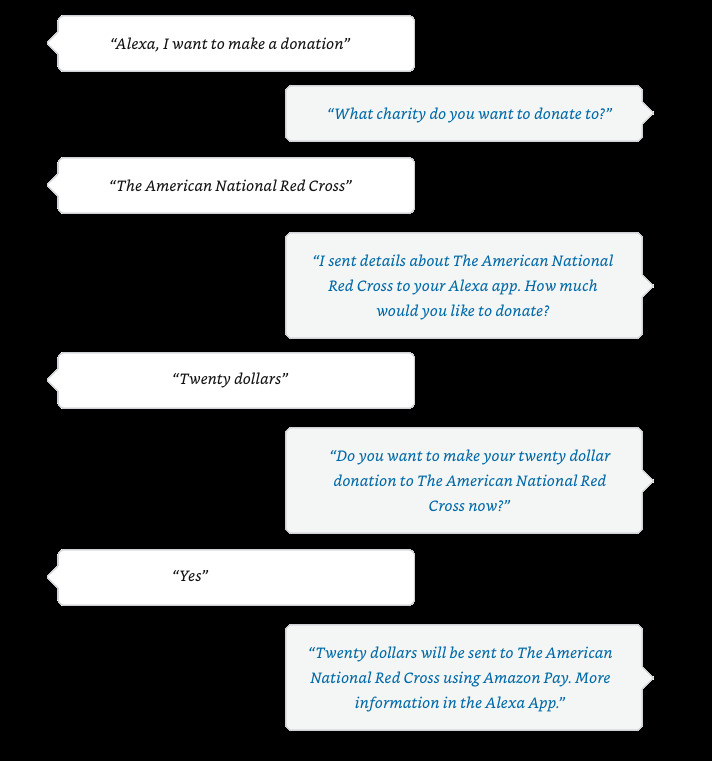 The following illustration shows a typical interaction between a donor and Alexa. When I use Amazon Pay to accept charitable donations on my website, what’s the donor experience? You place the Donate with Amazon button on the page or pages of your website where it works best for you. When donors click the Donate with Amazon button, they will be presented with options for selecting an amount to donate, and will be guided through the donation process in a few very simple steps, using their Amazon credentials. If this is the first time the donor has used Amazon Pay to make a donation to you, the donor will be asked to consent to sharing certain information with you. You can enable Alexa Donations simply by registering for Amazon Pay. No Alexa skill development or technical expertise is required. When you complete registration, we will begin the work on our side to enable you, and will notify you as soon as the work is complete. A "hosted" integration for one-time donations: With this option, Amazon Pay provides you with the button code that you need. There are a few simple tasks that you complete, including placing the provided button code on your website (on the page or pages that you choose). Amazon Pay will take care of the rest. See the Donate with Amazon integration guide for details. Integration with an ecommerce provider plug-in: If you already use an ecommerce provider to host your site, we may have a plugin from that ecommerce provider that would allow you to integrate with Amazon Pay. You can find information about ecommerce providers, and links to their set-up pages, on the Amazon Pay site at https://pay.amazon.com/us/integration-options. A custom integration, using APIs: If the hosted integration doesn't work for you and if you would like to have more control over the donation experience, you can do a custom integration with Amazon Pay. See the Amazon Pay and Login with Amazon integration guide for details. A custom integration, using APIs, for sustained giving: We also have an option to set up sustained giving functionality on your website, using APIs. See the Amazon Pay with recurring payments integration guide for details. You may want to use Amazon Pay for accepting donations, and also use it on your website for selling merchandise. In order to do both, you need to set up separate Amazon Pay merchant accounts. Please be aware that if you register for both a charitable organization (501(c)(3)) account and a regular Amazon Pay account for selling merchandise, you must use a different email address and Business Name when completing the registration flow for each account. After we have finished setting up your Amazon Pay merchant account, please do not change the Seller Display Name that is listed in Seller Central. We recommend that you communicate with your supporters about the availability of the Amazon Pay donation functionality. For example, you might want to do an email, direct mail, or social media campaign with tips on how to make donations. Funds that have been donated to you will be disbursed to the bank account that was specified during your account registration. Please be aware that Amazon Pay withholds a minimum balance in your account — a "reserve" — to secure payment obligations that might arise, such as for refunds or chargebacks. We reserve only a portion of the funds in your account. Can I get donated funds more quickly? Yes, you can. Amazon Pay uses a tiered plan to determine what reserve rate we will apply, reducing your reserve requirement as you build a positive history with Amazon Pay. We calculate your reserve requirement daily based on your tier and your recent donation volume. To learn about the different reserve tiers and how you can qualify for and request an upgrade, see the Amazon Pay reserve policy. No. Your donors will receive an automated email from Amazon Pay confirming the donation, but that email is not a tax receipt. You will need to send a tax receipt to the donor, as applicable. Donor billing address information is available to you in the daily Capture reports in Seller Central, which you can generate and view on the Reports page. See How do I view information about the donations that have been made to me? for details on how to access Capture reports. Amazon Pay provides two types of reports in Seller Central, and both of these reports will help you keep track of donations that have been made to you. A settlement report provides a detailed breakdown of your account activity for a given period and the funds disbursed to you. To create and view settlement reports, click Reports > Payments. You can use a settlement report to support your reconciliation processes. For instructions on how to download and read your settlement report, see Settlement reports. A transaction report provides information about Captures, including the email addresses of your donors. To create and view transaction reports, click Reports > Payments Transaction Reports. You can use transaction reports to synchronize the status of donations with the information in your system, and can also use them to analyze refund rates. For instructions on how to download or read your transaction report, see Obtaining transaction and settlement reports on Seller Central. Note: Your donor billing address data and donor email address are available in the daily capture reports. See Amazon Pay donation reports for details. In the unlikely event that one of your donors requires a refund, you issue the refund on the Manage Transactions page in Seller Central. The screen shot below shows the Refund button in Seller Central. For more information about the process, see Issuing a refund in Seller Central. If you have integrated with Amazon Pay by using a custom integration, you can also issue refunds by using the Refund API. See Refund API for details. Note that if a refund is issued to a donor, the $0.30 transaction fee associated with the original donation is not refunded to you. In cases where the donor contacts Amazon Pay about a refund of a donation made through Alexa Donations, rather than contacting you directly, the Amazon Pay customer service representatives will automatically issue a refund to the donor, and the refunded amount will be charged to you. To track refunds, we recommend that you regularly view or download Refund reports in Seller Central. In Seller Central, click Reports > Payments Transaction Reports, and then click the Refunds tab. For information about how chargebacks are handled, see Handling chargebacks. Note that donations aren't covered under the Amazon Pay Buyer Dispute Program. If you have questions for Customer Support, please send an email to amazonpay-nonprofit-help@amazon.com.